Blue Mars Blog: Henk Rogers: Mission Mars! Henk Rogers, new CEO of Avatar Reality, met with Blue Mars members on Wednesday, May 11 to make one thing perfectly clear: He's here to make Blue Mars the epitomy of Virtual World platforms. While Henk is a bit frustrated that Blue Mars is not yet in the orbit it deserves, Henk declares we have the right technology and the right developers to make it happen. During Henk's visit, he listened to the questions and desires of the member base and responded in favor of most requests. He's working on a plan for the Blue Mars platform, and once it's in place many exciting things can happen. New Cities? Rogers says that he has a plan for Blue Mars, and once that plan is far enough along, cities are definitely a part of it. Vehicles? Henk stated that vehicles were possible, but they should be added when we have sufficiently large terrain to require vehicles. Card Games? Henk believes card games should be relatively easy to put in Blue Mars. The ability to interact with objects and animals through the use of AI? Henk says that will be an important part of Blue Mars as it develops. Anything new? Henk mentioned plans he's working on an Adventure Engine to drive quests and related adventures. 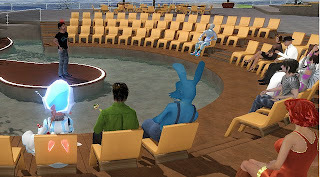 As to the relationship between Blue Mars on the PC and Blue Mars Mobile, Henk stated that the intent of the mobile project is to drive traffic into the Blue Mars virtual world. The Mobile platform reaches a new market and new uses, but it exists as a sibling and support to the virtual world. Henk promised more meetings with the citizens of Blue Mars who look forward to news of his plan and moving with Henk into the Martian future. This is an interesting list - interesting because of the level at which it is pitched. I think the key underlying requirement is that the actual process of third-party development for Blue Mars be made less difficult. Until then, few of the things listed will see the light of day. Fix the relationship with developers, however, and you might get a thriving world. But he never told us what his favourite colour is!